LFM addon writer for two addons. Send me the download link of the written addon and I make it (and you) famous by my blog. First addon: BGResser. This addon writes a timer (or a bar) when the people will resurrect in the graveyard in battlegrounds, rated battlegrounds and Tol Barad. The resurrection happens in pulses and as soon someone dies, from his countdown the other addon users would know when the res will happen. The main purpose is to figure out when it's benefical to just die and res in 5 secs later and when shall you kite, use CDs to keep the enemy busy. Also when it's better not kill an enemy as he'll res in 5 secs, but wait to make sure that he sees that lovely countdown from 30. Second addon: TBBars. This addon displays how the capture bars stand in the different bases of Tol Barad. The players can see their own capture bars if they are inside a base, so the addon should read that and communicate it between addon users, allowing them to see the status of all three bases. This can be translated to gaming: "Any sufficiently skill-requiring feature is indistinguishable from an unbalanced, bugged feature". This is why the forums are always full of "nerf X" comments. For someone who is unable to not stand to the frozen circle, mage CC is "outrageous". For someone who can't kite, melee is overpowered. For someone who can't cancel-cast or other-school-cast, interrupts are overpowered. But this isn't today's topic. It's the mentioned phenomenon looking from the other side: "Any sufficiently primitive technology using people are indistinguishable from savages/animals" or in gaming "Any sufficiently skill-less person is indistinguishable from a moron/bot/AFKer". If something is "skill" to you, something that you must focus on, you understand that others are not there yet. You see them as less advanced. However when something is obvious to you and you would never-ever mess it up, you consider the one failing in it a moron. However this is not surely true. Our brain is extremely adaptive and can learn very complicated stuff. Just because something is obvious to you, it doesn't mean it's not hard. For example recognizing a face is so obvious that we consider those who are unable to do it, mentally crippled. However face recognition softwares are still far from perfect despite the huge programming effort placed in them. Maybe I'm too swift to consider someone "moron or slacker" when he fails in some very basic gaming task like "gem your gear" or "don't hit the siege". Maybe these things are not as obvious as they are to me, so calling him an idiot is not correct. Of course I'm still not a "freindly helpfull peep", the guy is practically useless to me so I have no reason to be any positive to him. But shouldn't be negative either. I shall be simply descriptive and professional: "you have no gems, you won't come" or "Sieges have 1M HP, if you are killing a siege, you are CC-ed for 2 mins". I figured it out when I was in a rated BG. Some of my guildmates, despite proven to be good raiders, did atrocious things there. I automatically called them morons and such. But they are not morons, they have proven it several times. The solution is that they have much to learn in PvP. That means much more rated BGs than before, because only lot of practice will reveal the problems, allowing them to be corrected. I dont know where to put these so I figured here was good. Here is my moron submission. (http://us.battle.net/wow/en/character/queldorei/oridor/advanced) Oridor came into my ZA run this morning and immediately pulls the first mobs and dies almost instantly. I inspect him and much to my dismay he has full PvP ret gear gemmed for resilience. Yeah. We ask him to put on his tank gear and take of seal of insight and he doesnt. He wont leave an begins to lecture us about how we dont have lives, after 15 mins we can FINALLY kick him. I just thought it was a little gem. why did you invite someone named "just" which includes special character anyways? @the post: well, that was unnecessary really. You have defined what is a newbie and a M&S many times in the past. If someone still hasn't gotten the difference, he is probably the second. Another thing, I never understood why don't you separate morons and slackers. For example I remember a guy that was on Gormok in ToTC doing his best to hit the top of recount by nuking the boss despite the fact that healer next to him was running around with kobold on his back (we were not doing achievement) Other type of player is a retri (yesterday in Throne of the tides) that refused to use repentance several times. Finally when I convinced him to use it he casts hand of freedom instead. I know that cc is obsolete in HC's these days but sometimes I (healer) run into a group that still finds them challenging. Now first one is obvious slacker, sad thing is that he somehow ended up in one of the top 5 guilds on realm. Other is moron that is ungemmed and unenchanted and refuses to use his abilities to help his group to overcome challenging content. People who refuse to correct themselves deserve all the bad things that come their way imo. "I automatically called them morons and such." As a leader, you shouldn't refer to your guildies/teammates like that, if people do mistakes or stupid stuff, point them out, blame them, fine them, kick them or whatever, but don't be rude if you want them to learn and not make them angry, because positive atmosphere in a team means a lot and cursing is no good for motivation. 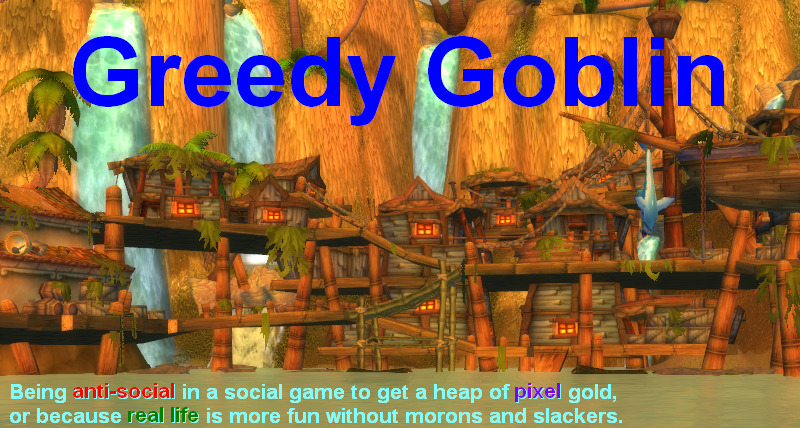 @nizari your gormock example doesn't necesseraly mean he a slacker he may have had tunnel vision, and the fact he got accepted in a top 5 guild could mean he overcame that issue, which would mean he is not a slacker. @gevlon what do you define someone who has learnt the ideas behind something but lacks the ability to execute them. using your face recognition example, someone who knows what makes up a face but is unable to recognize one. "@nizari your gormock example doesn't necesseraly mean he a slacker he may have had tunnel vision, and the fact he got accepted in a top 5 guild could mean he overcame that issue, which would mean he is not a slacker." Much more likely is that he expects everyone to just be able to power through faceroll content and thus just cares about pulling maximum dps, cause that's a lot more enjoyable in this type of content. Was your moron using randomly capitalizing words in the hope that he might get one at the beginning of a sentence ? Okay, so someone is a M&S if they get good advice, and CBA to follow it. What if they get *bad* advice? Such is easily come by, especially if you, say, read instructions given randomly in a BG channel. Distinguishing 'actually CBA' and 'assumes this is yet more bad advice, and is seeking to get out of the conversation with as little effort as possible' seems like a potential problem. Nonsense, you'll find cursing and raging quite common in top guilds. Gets the job done and no one cares about it after the raid is over and the bosses died. Although I am not Gevlon, I would answer "Handicapped". "I shall be simply descriptive and professional: "you have no gems, you won't come" or "Sieges have 1M HP, if you are killing a siege, you are CC-ed for 2 mins". 1. You will be less stressed yourself and you will stress others less. And for those that care about those things, you will be seen as a "nicer guy" (and there is no harm in being seen with a better light, I believe). 2. By providing articulate reasons why someone "fails" you allow them to hear, review and improve. If they indeed consistently fail, then like our rules already say: take them out since they are just wasting their time, their gold and everyone else's time. "But they are not morons, they have proven it several times. The solution is that they have much to learn in PvP. That means much more rated BGs than before, because only lot of practice will reveal the problems, allowing them to be corrected." Additionally even the best player is destined to make mistakes every so often. I'm sure you do them too. And I sure as hell do a lot myself. @Nizari: As the former leader of a relatively successful guild, I can say that it is not surprising that a player with tunnel vision who actually does very high dps would get into a top guild. In a perfect world they wouldn't, but having a guy who puts out huge numbers who you know you have to yell at occasionally to attack the add or get out of the fire is not that bad. I've raided with several people who fall into this category, and they are very useful for first kills - they cause a few wipes on the way with bad play, but if you are only making the enrage by a few seconds then it's better to have a guy like that and hope than it is to have a reliable guy with bad dps and lose for sure. You have admitted here that people who are not morons in one area, can ACT like morons in another. Perhaps you can now admit that it's impossible to define a person as M&S because he did something (in your opinion) moronic? M&S is relative to the observer. "I have no reason to be any positive to him. But shouldn't be negative either." It took you a really, really long time to get here, but I'm happy that you finally made it. This is possibly the wisest thing I've ever read on your blog. I've seen the start of it in your BG/TB leadership in the last few months. More and more you've been using tactics that make other players the bad guy, and you merely a messenger of a problem. I think it's a change for the better. The "idc i play 4 fun" people are pretty funny/hypocritical. If they are doing something wrong and not pulling their weight, it's "idc i play 4 fun just go no-one died so it's fine", never mind that they are slowing you down. As soon as you do something wrong, they scream at you for being bad, not knowing how to play, not doing your job, even if no-one died and the boss is dead. And if you tell them "idc i play 4 fun no-one died so it's fine", they leave the group. We trolled an "idc i play 4 fun" after finding out he didn't want polite, friendly advice on how to heal without going oom every pull. We didn't get the adds off him on the first boss in Grim Batol, forcing him to do a better job to keep himself alive. We then parroted his words back at him til he left. I wonder if he noticed his hypocracy (of course not). "As the former leader of a relatively successful guild, I can say that it is not surprising that a player with tunnel vision who actually does very high dps would get into a top guild." He'd be a better player (hence potentially getting in an even better guild) if he can focus on his perfect rotation, and have no tunnel vision when such is required. about those addons: i think that's not possible, both. being able to see something doesn't mean the API to use it is exposed. for example, there is no way to get the resurrection timer for enemy graveyards, only for your own graveyards. and no, those aren't linked, and you can only retrieve the timer for the graveyard you're currently dead in. similarly, the capture status for bases in BG's is not open in the API. the only reason that you can get a DBM timer for AV, IoC, AB and BoG is because those show a message of "point X is under attack from Y".